Premium-Line Category 6 shielded Patch panel comply with ANSI/TIA-568-C.2, ISO/IEC 11801 and EN 50173-1 Class E specifications. The complete module complies with EU ROHS directive. The construction is in standard 1U 19” size, suits all 19” rack installation. The main metal frame and rear back cover are made of SECC material, with the thickness over 1.0mm. Dual type IDC accepts 22-26 AWG solid cable, easy for termination with 110 or Krone tools. The finished product is available in black or light gray RAL7035 color. EN 50173-1 Class E specifications. The complete module complies with EU ROHS directive. 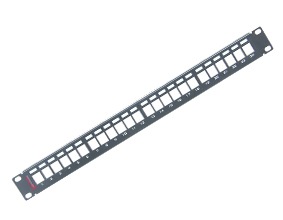 The construction is in standard 19” but in 0.5U size, this is the only difference from Premium-Line 1U shielded patch panel on the purpose of rack space saving. The main metal frame and rear back cover made by SECC material, with the thickness over 1.0mm. Dual type IDC accepts 22-26 AWG solid cable, easy for termination with 110 or Krone tools. The finished product available in black or light gray RAL7035 color. Premium-Line Category 6 19” high density patch panel, 24 port in 0,5U and 48 ports in 1U Size, could significantly expand your capacity by space saving in the rack! For any cross-connect rack and HC networking rack in the datacenter or TR, it’s the ideal design to achieve more flexible deployment and also anytime available end subscribers’ expansion. 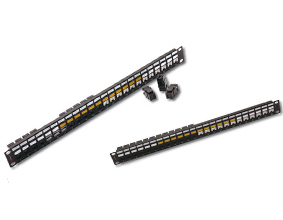 Two pieces easy click-in cable management bar at the back side is high strength affordable. The compact design saving physical space in rack and combine with its quality headroom margin performance, the panel is your ideal budget saving and competitive solution to others. The construction is in standard 1U 19” size, suits for all 19” rack installation. The main metal frame is made of SECC material, with the thickness over 1.0mm. Dual type IDC accepts 22-26 AWG solid cable, easy for termination with 110 or Krone tools. The finished product is available in 24 ports (1U) and 48 ports (2U).